The Skeptical Cardiologist Answers Good Questions: Retesting For Symptomatic Benign PVCs? One of the many things I enjoy about writing this blog is the interesting comments and questions that readers post. Many of them stimulate me to better answer and inform my patients. Wondering your opinion on retesting. I’ve had PVCs since I was 15 (63 now) and they have come and gone over the years, attributed to hormones, low potassium, stress, and dehydration/bad diet. Recently they started again and are driving me insane and none of the usual fixes are working. Two ER visits with normal EKGs and my cardiologist all say no worries. I’m thinking maybe I should have another ultrasound, buy MD doesn’t think it’s necessary. I had a perfectly normal cath in 2015 but no tests since. Your thoughts? Thank you. The answer reflects my clinical practice, which is based on 30 years of experience taking care of patients with PVCs, in conjunction with regularly reading papers, reviews and guidelines in this area. Periodically, both for specific patient problems and for blog questions, I will search the medical/scientific literature and review guideline publications to see if there is any new information that I am unaware of to ensure that my recommendations are scientifically grounded. In this case, a more prolonged search of the literature did not yield precise guidance on the frequency of retesting of patients with benign PVCs. In the absence of SHD, the most common indication for treating PVCs remains the presence of symptoms that are not improved by explanation of their benign nature and reassurance from the physician. In addition, some patients may require treatment for frequent asymptomatic PVCs if longitudinal imaging surveillance reveals an interval decline in LV systolic function or an increase in chamber volume. For patients with >10,000 PVCs/24 h, follow-up with repeat echocardiography and Holter monitoring should be considered. In patients with fewer PVCs, further investigation is only necessary should symptoms increase. It should also be recognized that PVC burden often fluctuates over time. This initial testing approach corresponds closely to what I wrote in my post on benign PVCs here. Retesting with echocardiography and Holter monitoring is advised for those few patients who have lots of PVCs, but the frequency of this retesting is not specified and cardiologists have to use their best judgement, balancing the cost (to patient and to society) and patient safety. Most cardiologists will err on the side of more frequent repeat testing for a variety of reasons. Personally, I will advise an annual echocardiogram to such patients since they are at a higher risk of developing a cardiomyopathy. In the absence of really frequent PVCs (>10,000 per 24 hours is a nice round number, but the precise cut-off is debatable), we should probably only repeat testing if the patient recognizes a significant change in their symptoms. The reader clearly fits into that category, and retesting in her will provide reassurance that all is still good with her heart. This, in turn, should help with managing symptoms and preventing recurrent ER visits. For example, if the reader had a normal echocardiogram 6 months ago should we repeat it when symptoms worsen? My reflex answer would be no, but at some time interval depending on the individual characteristics of the case-patient risks for heart disease, patient anxiety levels, patient symptom severity and frequency, the answer would become yes. Cardiologists have to answer dozens of questions like this daily. There is no science to inform a precise answer, consequently the answers will vary wildly from one cardiologist to another depending on a variety of factors specific to the cardiologist. Those cardiologist-specific factors are complex and sometimes controversial. Part of this makes up the art of medicine and part reflects the business of medicine. They are definitely worthy of another post when time permits. N.B. The Eternal Fiancee’ (my layperson surrogate) expressed surprise that one could have 10 000 PVCs per day. I told her that if your heart beats roughly once per second (6o beats per minute) since there are 60 x 60 x 24 = 86400 seconds in a day, your heart beats almost 90 000 times in 24 hours. Thus, roughly 1 in 9 beats is a PVC. Can AliveCor’s Mobile ECG Device Combined With Its Kardia Pro Cloud-Based Platform Replace Standard Long Term Rhythm Monitors? In March of 2017 AliveCor introduced Kardia Pro, a cloud-based software platform that allows physicians to monitor patients who use the Kardia mobile ECG device. I signed up for the Kardia Pro service about 3 months ago and all of my patients who purchased Kardia devices prior to March of 2017 have been migrated automatically to Kardia Pro by AliveCor. Now (post March 2017), patients who acquire a Kardia device must sign up for the Kardia Pro service at $15 per month to connect with a physician. I think this is money well spent and I’ll demonstrate how the service works with a few examples. I saw a 68 year old man with persistent atrial fibrillation that was first diagnosed at the time of pneumonia in late 2017. He underwent a cardioversion after recovering from the pneumonia but quickly reverted back to AF. His prior cardiologist offered him the option of repeat cardioversion and long term flecainide therapy for maintenance of normal sinus rhythm (NSR) but he declined. We discussed methods for monitoring his rhythm at this point which include a 24 Holter monitor, a 7 to 14 day Long Term Monitor, a Cardiac Event Monitor and a Mobile Cardiac Outpatient Telemetry device. These devices are helpful and although expensive are often covered by insurance. They require wearing electrodes or a patch continuously and the results are not immediately available. I also offered him the option of monitoring his AF using a Kardia device with the recordings connected to me by Kardia Pro. He purchased the device on his own for $99, downloaded the app for his smartphone and began making recordings. I enrolled him in my Kardia Pro account and he received an email invitation with a code that he entered which connected his account with mine, allowing me to view all of his recordings as they were made. When I log into my Kardia Pro account I can now view a graphic display of the recordings he has made with color coding of whether they were considered normal or abnormal by Kardia. The patient overview page also displays BP information if the patient is utilizing certain Omron devices which work with Kardia. 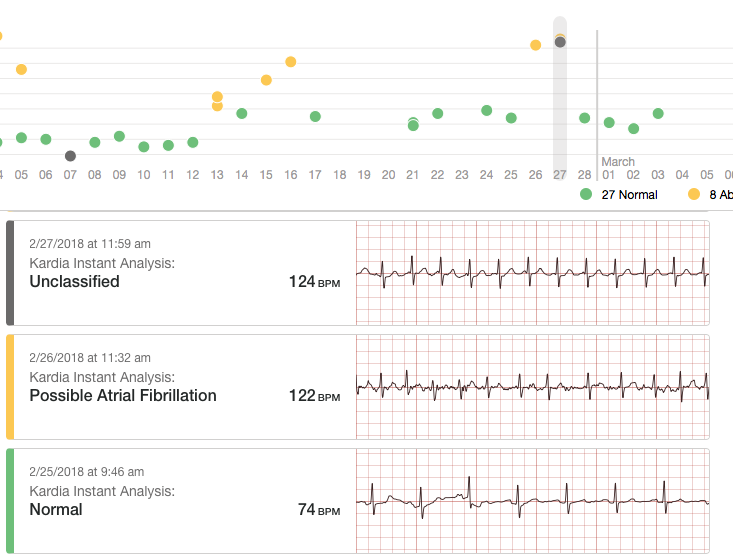 The display shows that after our office visit he maintained NSR for 3 days (green dots) and then intermittently had ECG recordings classified as AF (yellow dots) or unclassified (black). The more he used the device and got feedback on when he was in or out of rhythm the more he was able to recognize symptoms that were caused by AF. The ECG can then be archived or exported for entry into an EHR. to me are obvious: we now have an instantaneous patient-controlled method for knowing what his cardiac rhythm is doing whether he is having symptoms or not. This knowledge allows me to make more informed treatment decisions. When I log into kardia pro I see this screen. It contains buttons for searching for a specific patient or adding a new patient. Adding new patients is a quick and simple process requiring input of patient demographics including email and birthdate. From the opening screen you can click on your triage tab. I have elected to have all non normal patient recorded ECGS go into the triage tab. Another patient’s Kardia Pro page shows that he records an ECG nearly every day and most of the time Kardia documents NSR in the 60s. Overall, he has made 773 recordings and 677 of them were NSR, 28 unanalyzed (due to brevity) , 13 unclassified and 55 showing AF. Another patient I saw for the first time recently has had long-standing persistent AF. His previous cardiologist performed an electrical cardioversion a year ago but the patient reverted back to AF in 40 hours. Before seeing me he had purchased a Kardia mobile ECG device and was using it to monitor his heart rate. After he accepted my email invitation to connect via Kardia Pro I was able to see his rhythm and rate daily. 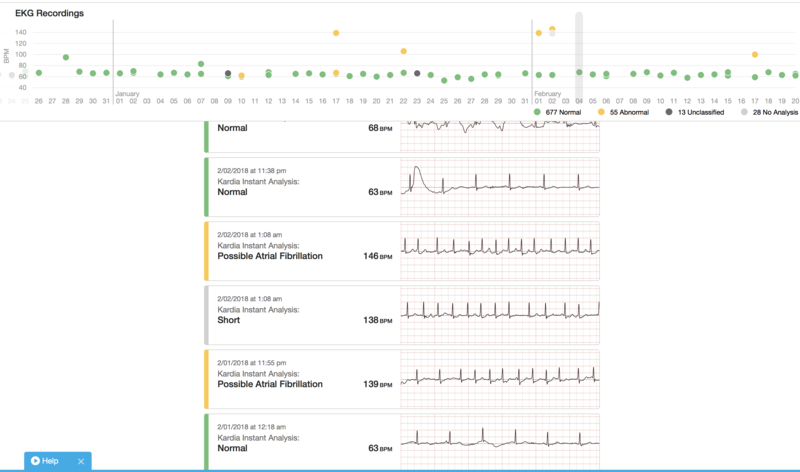 The Kardia Pro chart belowshows his daily heart rate while in atrial fibrillation. We utilized this to guide titration of his rate controlling medications. Such precise remote monitoring of heart rate in AF (which is often difficult to accurately assess by standard heart rate devices) obviates the need for office visits for 12 lead ECGs or periodic Holter monitors. I performed a second cardioversion on him after which he made daily recordings documenting maintenance of NSR. With this system we can determine exactly when AF returns, information which will be very helpful in determining future treatment options. There are many potential applications of the Kardia ECG device beyond AF monitoring (assessing palpitations, PVCs, tachycardia, etc.) but they are all enhanced when the device is combined with a good cardiologist connected to the device by Kardia Pro. On the other hand patients who are not on Kardia Pro have to come into the office for 12-lead ECGs. When they call I feel like my diagnostic tools are limited. Such patients usually end up getting one of the standard Long Term Monitoring (LTM) Devices. If I am fortunate, after a few days to weeks , the results of the LTM will be faxed to my office. I am optimistic based on this early experience with Kardia Pro that ultimately this service in conjunction with the Kardia Mobile ECG device (or similar products) will replace many of the more expensive and inconvenient long term monitoring devices that cardiologists currently use. The skeptical cardiologist has many patients who are successfully using their AliveCor/Kardia devices to monitor for episodes of atrial fibrillation (afib). However, a significant number of patients who have had atrial fibrillation also have premature beats. Sometimes patients feel these premature beats as a skipping or irregularity of the heart beat. Such palpitations can mimic the feeling patients get when they go into atrial fibrillation. The ideal personal ECG monitor, therefore, would be able to reliably differentiate afib from premature beats for such patients. I’ve discussed premature ventricular contractions (PVCs) here and here. Premature beats can also originate from the upper chambers of the heart or atria. Such premature atrial contractions (PACs) have generally been considered benign in the past but a recent study showed that frequent (>30 s per hour) PACs or runs of >20 PACs in a row were associated with a doubling of stroke risk. 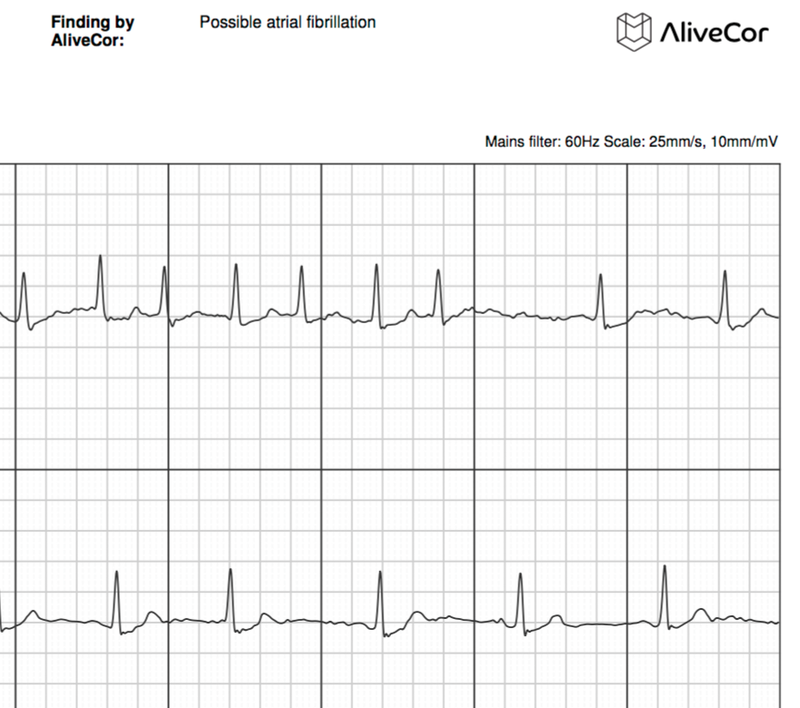 For patients who experience either PVCs or PACs the AliveCor device is frequently inaccurate. Unfortunately only one of the four “possible atrial fibrillation” recordings has any atrial fibrillation: this one has 7 beats of afib initially then changes to normal sinus rhythm (NSR). 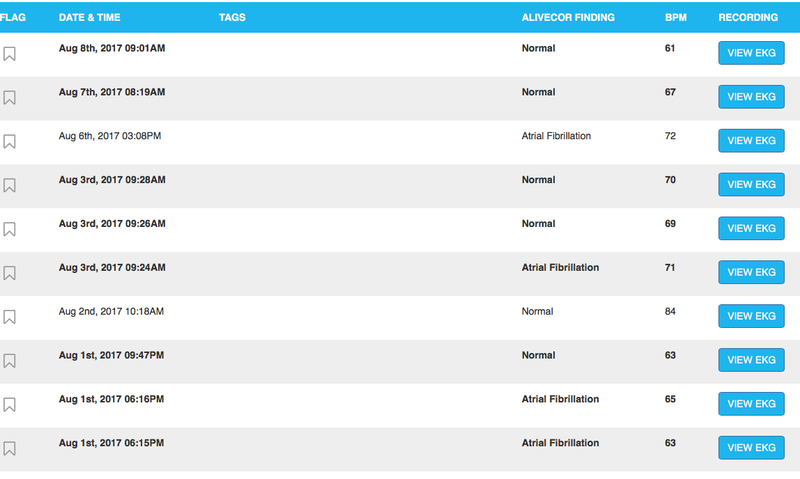 The other 3 recordings identified by AliveCor as afib are actually normal sinus rhythm with premature beats. 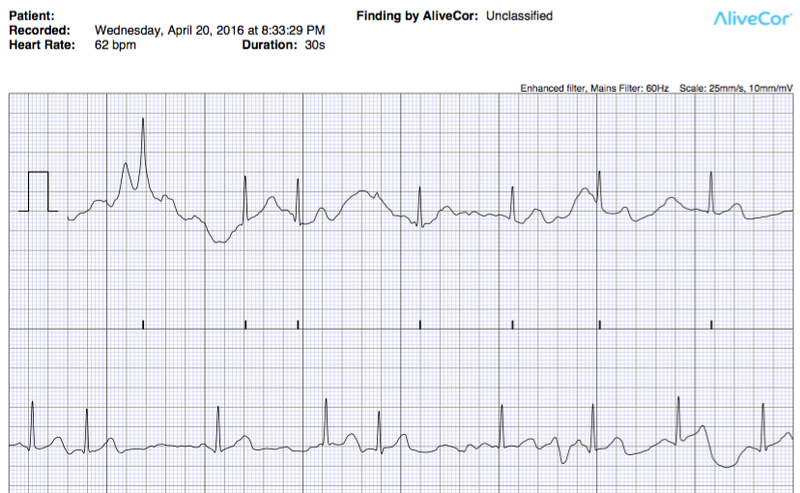 I wrote about the first patient I identified in my office who had frequent PVCs which were misdiagnosed by AliveCor as afib here. Since then, I’ve come across a handful of similar misdiagnoses. One of my patients began experiences period palpitations 5 years after an ablation for atrial fibrillation. He obtained an AliveCor device to rec ord his rhythm during episodes. At other times he has periods of atrial bigeminy which are also called afib by AliveCor. 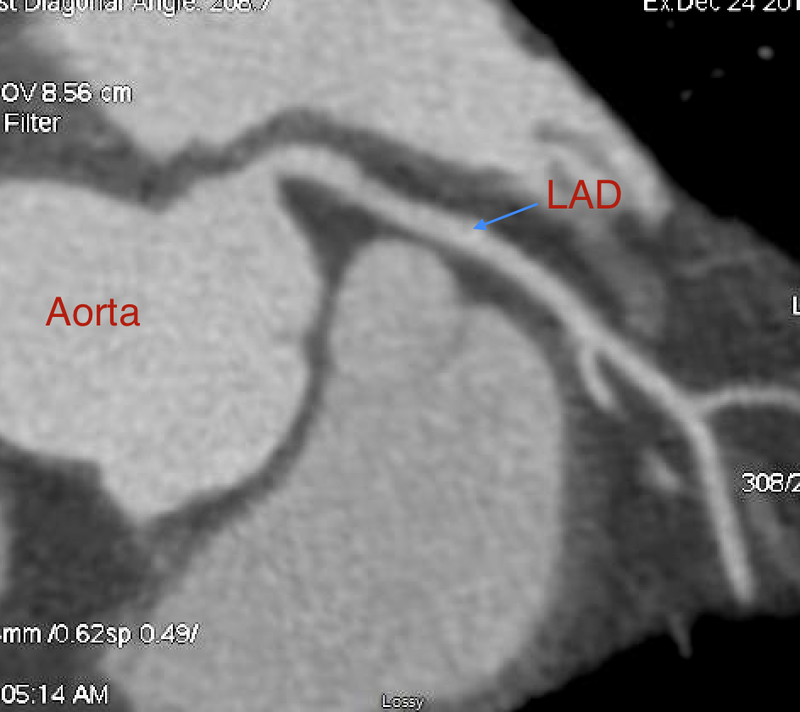 In this tracing he has atrial bigeminy and a PVC. 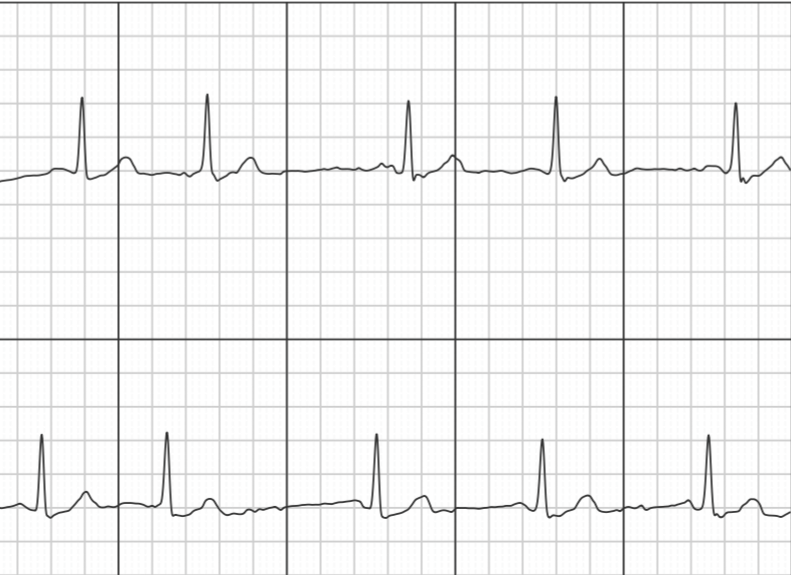 Premature beats sometimes are interpreted by AliveCor as normal. 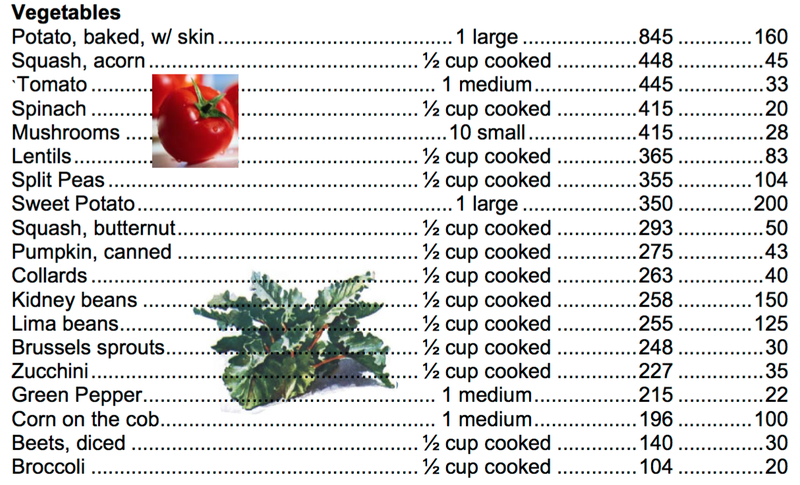 A reader sent me a series of recordings he had made when feeling his typical palpitations. all of which were called normal. Indeed, all of them but one showed NSR. However on the one below the cause of his palpitations can be seen: PVCs. I obtained the “Normal” tracing below from a patient in my office with a biventricular pacemaker and frequent PVCs who had no symptoms. A woman who had undergone an ablation procedure to eliminate her very frequent PVCS began utilizing AliveCor to try to determine if she was having recurrent symptomatic PVCs. She became quite frustrated because AliveCor kept reading her heart rate at 42 BPM and giving her an unclassified reading. AliveCor is always going to call rhythms (other than afib) unclassified when it counts a heart rate less than 50 BPM or greater than 100 BPM. 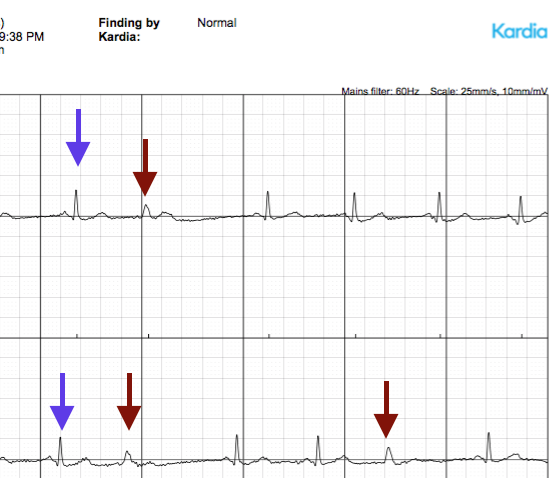 In this patient’s case, every other beat was a PVC (red circles). 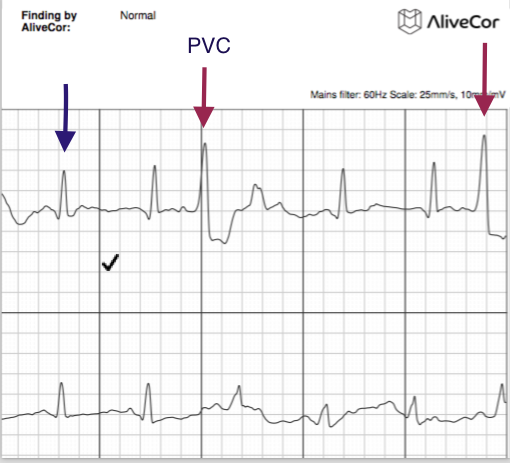 Her PVCs are sufficiently early and with low voltage so the AliveCor algorithm cannot differentiate them from T Waves and only counts the normal sinus beats toward heart rate. I should point out that many of my patients get a very reliable assessment from their devices. These tracings from a woman with paroxysmal atrial fibrillation are typical: all the Normal readings are truly normal and all the atrial fibrillation readings are truly atrial fibrillation with heart rates above 100. 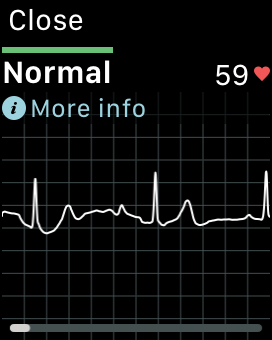 The Normal Detector in the AliveECG app notifies you when a recording is “normal”. This means that the heart rate is between 50 and 100 beats per minute, there are no or very few abnormal beats, and the shape, timing and duration of each beat is considered normal. What qualifies as “very few” abnormal beats is not clear. The manual goes on to state that the AliveCor normal detector has been designed to be conservative with what it detects as normal. 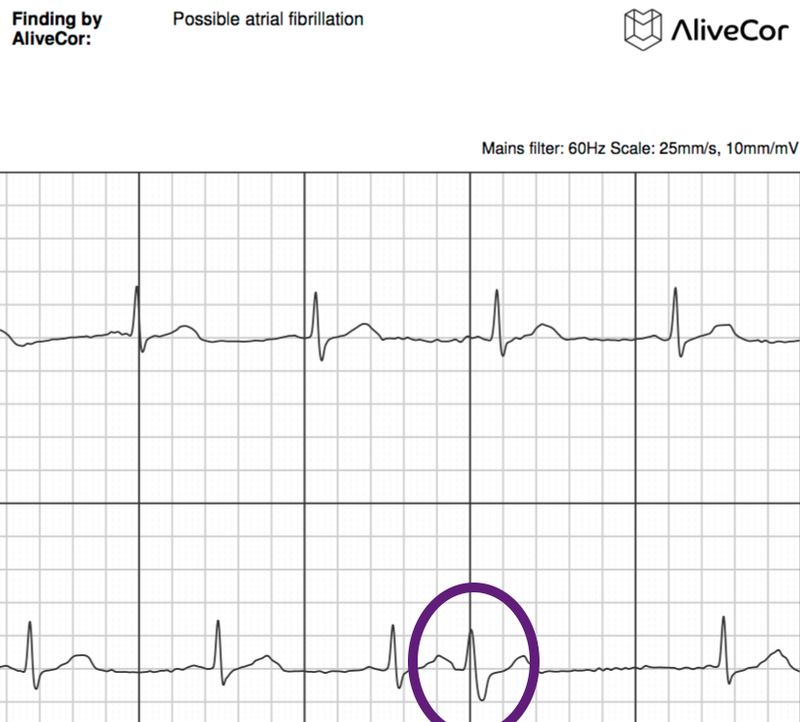 What is clear is that premature beats significantly confuse the AliveCor algorithm. Both PVCs and PACs can create a false positive diagnosis of atrial fibrillation when it is not present. Consequently, if you have afib and premature beats you cannot be entirely confident that a reading of afib is truly afib. Strongly consider having the tracing reviewed by a cardiologist before concluding that you had afib. On the other hand if you are experiencing palpitations and make a recording with Alivecor that comes back as normal do not assume that your heart rhythm was totally normal. While highly unlikely to be afib, your palpitations could still be due to PACs or PVCs. 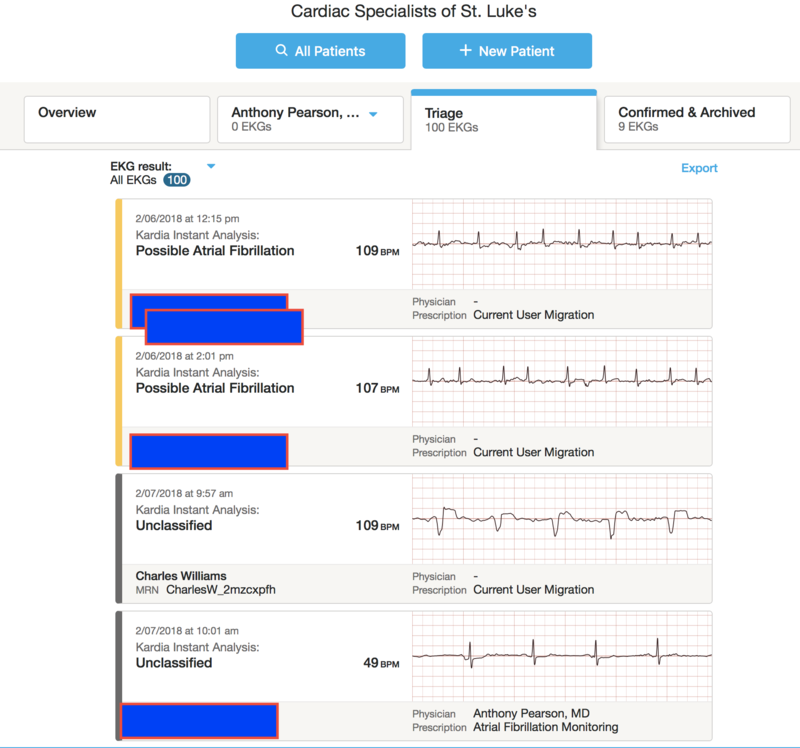 If a patient of mine has an abnormal or questionable AliveCor recording it is currently a very simple process for me to review the recording online through my AliveCor doctor dashboard. The recordings can also be emailed to me. AfibAlert Versus AliveCor/Kardia: Which Mobile ECG Device Is Best At Accurately Identifying Atrial Fibrillation? The skeptical cardiologist has been testing the comparative accuracy of two hand-held mobile ECG devices in his office over the last month. 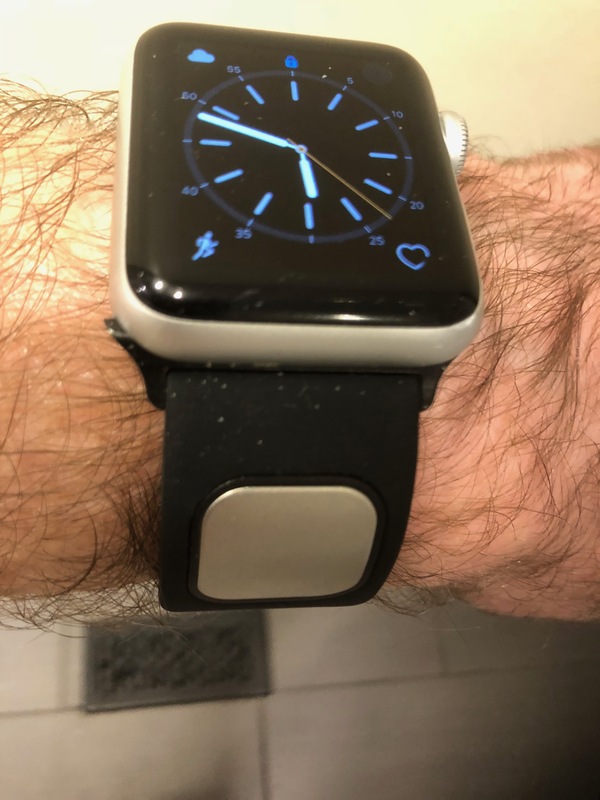 I’ve written extensively about my experience with the AliveCor/Kardia (ACK) device here and here. Most recently I described my experience with the Afib Alert (AA) device here. Over several days I had my office patients utilize both devices to record their cardiac rhythm and I compared the device diagnosis to the patient’s true cardiac rhythm. In 14 patients both devices correctly identified normal sinus rhythm. AFA does this by displaying a green check mark , ACK by displaying the actual recording on a smartphone screen along with the word Normal. The AFA ECG can subsequently uploaded via USB connection to a PC and reviewed in PDF format. The ACK PDF can be viewed instantaneously and saved or emailed as PDF. In 5 patients in normal rhythm (NSR) , AFA correctly identified the rhythm but ACK was either unreadable (3) or unclassified (2). In the not infrequent case of a poor ACK tracing I will spend extra time adjusting the patient’s hand position on the electrodes or stabilizing the hands. With AFA this is rarely necessary. In this 70 year old man the AFA device recording was very good and the device immediately identified the rhythm as normal. ACK recording was good quality but its algorithm could not classify the rhythm. There were 3 cases were AFA diagnosed atrial fibrillation (AF) and the rhythm was not AF. These are considered false positives and can lead to unncessary concern when the device is being used by patients at home. In 2 of these ACK was unreadable or unclassified and in one ACK also diagnosed AF. A 90 year old woman with right bundle branch block (RBBBin NSR was classified by AFA as being in AF. 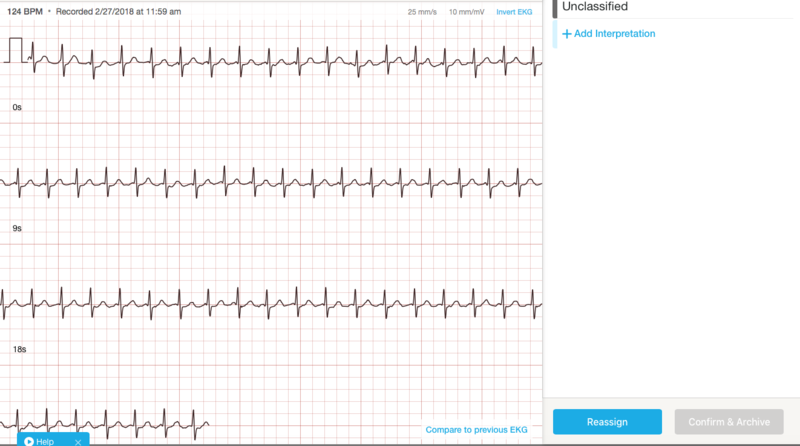 AliveCor tracing calls this unclassified. The algorithm does not attempt to classify patients like this with widened QRS complexes due to bundle branch block. If you have been diagnosed with a condition that affects the shape of your EKG (e.g., intraventricular conduction delay, left or right bundle branch block,Wolff-Parkinson-White Syndrome, etc. ), experience a large number of premature ventricular or atrial contractions (PVC and PAC), are experiencing an arrhythmia, or took a poor quality recording it is unlikely that you will be notified that your EKG is normal. One man’s rhythm confounded both AFA and AC. This gentleman has had atrial flutter in the past and records at home his rhythm daily using his own AliveCor device which he uses in conjunction with an iPad. During our office visits we review the recordings he has made. He was quite bothered by the fact that he had several that were identified by Alivecor as AF but in fact were normal. A recording he made on May 2nd at 845 pm was read as unclassified but with a heart rate of 149 BPM. 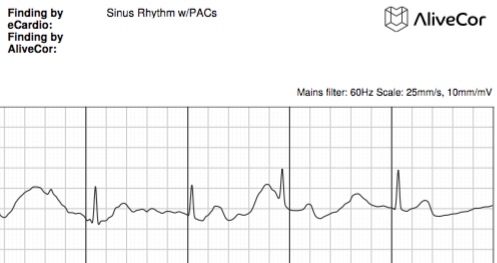 The rhythm is actually atrial flutter with 2:1 block. AFA classified Lawrence’s rhythm as AF when it was in fact normal sinus with APCs. One patient a 50 year old woman who has a chronic sinus tachycardia and typically has a heart rate in the 130s, both devices failed. We could have anticipated that AC would make her unclassified due to a HR over 100 worse than unclassified the tracing obtained on her by AC (on the right)was terrible and unreadable until the last few seconds. On the other hand the AFA tracing was rock solid throughout and clearly shows p waves and a regular tachycardia. For unclear reasons, however the AFA device diagnosed this as AF. In 2/4 patients with AF, both devices correctly classified the rhythm.. In one patient AFA correctly diagnosed AF whereas ACK called it unclassified. The sensitivity of both devices for detecting atrial fibrillation was 75%. The specificity of AFA was 86% and that of ACK was 88%. ACK was unreadable or unclassified 5/26 times or 19% of the time. The sensitivity and specificity I’m reporting is less than reported in other studies but I think it represents more real world experience with these types of devices. -Recordings using AfibAlert are usually superior in quality to AliveCor tracings with a minimum of need for adjustment of hand position and instruction. -This superiority of ease of use and quality mean almost all AfibAlert tracings are interpreted whereas 19% of AliveCor tracings are either unclassified or unreadable. -Sensitivity is similar. Both devices are highly likely to properly detect and identify atrial fibrillation when it occurs. -AliveCor specificity is superior to AfibAlert. This means less cases that are not AF will be classified as AF by AliveCor compared to AfibAlert. This is due to a more conservative algorithm in AliveCor which rejects wide QRS complexes, frequent extra-systoles. Both companies are actively tweaking their algorithms and software to improve real world accuracy and improve user experience but what I report reflects what a patient at home or a physician in office can reasonably expect from these devices right now. The skeptical cardiologist has often sung the praises of the AliveCor Mobile ECG for home and office heart rhythm monitoring (see here and here.) However, there is a significant rate of failure of the device to accurately identify atrial fibrillation. I’ve seen numerous cases where the device read afib as “unclassified” and normal sinus rhythm (usually with PVCs or PACs) called afib both in my office and with my patient’s home monitors. In such cases it is easy for me to review my patient’s recordings and clarify the rhythm for them. For those individuals who do not have a cardiologist available to review the recordings, AliveCor offers a service which gives an option of having either a cardiac technician or cardiologist review the tracing. 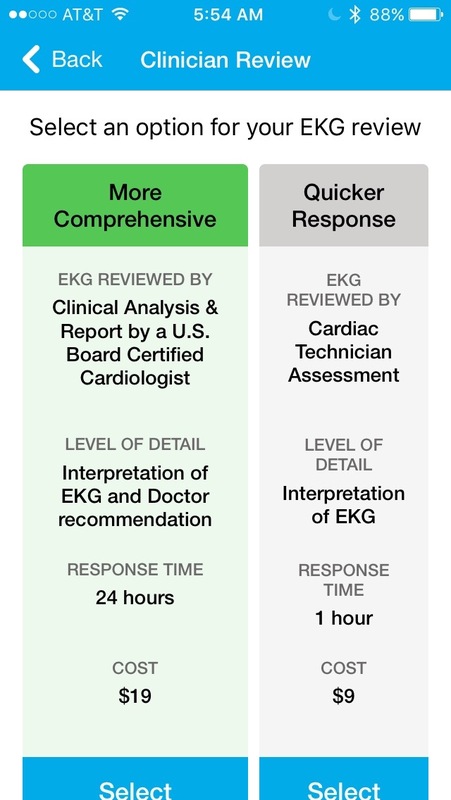 The “cardiac technician assessment” costs $9 and response time is one hour. The “Clinical Analysis and Report by a U.S. Board Certified Cardiologist” costs $19 with 24 hour response time. Obviously, I have no need for this service but I’ve had several readers provide me with their anecdotal experiences with it and it hasn’t been good. He then had requested the cardiologist reading which came back as Normal Sinus Rhythm. I was able to review this with our Chief Medical Officer who advised that the recording shows Sinus Rhythm with PACs. The Compumed report seldom provides identification of PACs and PVCs as most cardiologists believe they are not significant findings. The sustained AFib finding was incorrect, so I have refunded the $5 fee you had paid. As I pointed out in my post on palpitations, most PVCS are benign but some are not and patients with palpitation would like to know if they are having PVCS and/or PACs when they feel palpitations. More importantly, the misdiagnosis of afib when the rhythm is NSR with PACs or PVCs can lead to extreme anxiety. 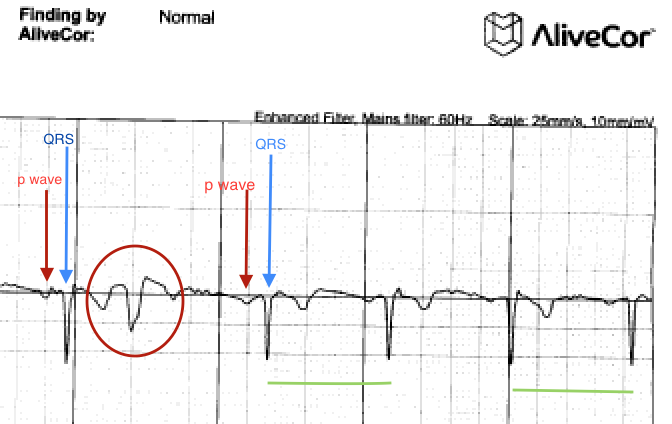 This tracing clearly (to me) shows regular and similar upward deflections (red arrow, p waves) which are a similar distance from the QRS complexes which follow (QRS complexes). The green arrows point to irregular deflections due to noise which can confuse computer algorithms (and non-cardiologists.) 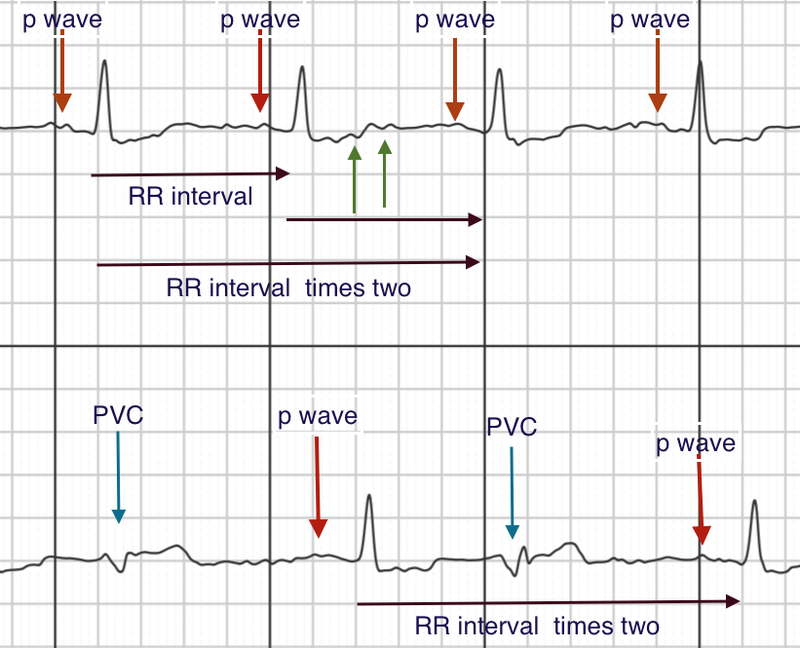 The distance between the QRS complexes is very regular (black arrow, RR interval). Thus, this is clearly normal sinus rhythm (NSR). Later in the recording PVCs (green arrows) are noted occurring every other beat. The distance between the QRS complexes on either side of the PVC is still the same as two RR intervals. This is clearly ventricular bigeminy. I made in my office this morning on a patient with cardiomyopathy and a defibrillator. The AliveCor algorithm is not alone in making frequent errors in the diagnosis of atrial fibrillation. The vast majority of ECGs performed in the US come with an interpretation provided by a computerized algorithm and medical personnel rely on this interpretation until it can be verified or corrected by an overreading cardiologist. Another study found that 19% of ECG-C misinterpreted normal rhythm as atrial fibrillation. Failure of the physician ordering the ECG to correct the inaccurate interpretation resulted in change in management and initiation of inappropriate treatment, including antiarrhytmic medications and anticoagulation, in 10% of patients. Additional unnecessary diagnostic testing was performed based on the misinterpreted ECGs in 24% of patients. When lives or peace of mind are at risk you want your ECG interpreted by a cardiologist. I would like to take this opportunity to personally issue a challenge to IBM’s Watson. Hey, Watson, I bet $1,000 I can Interpret cardiac rhythm from an ECG with more accuracy than you can!